Are you the 1 in 4 Americans? Today, there is widespread interest in autonomous vehicles, but the U.S. — one of the largest auto markets in the world — expresses higher levels of resistance than most nations. Today, marketing research firm IPSOS has released a study with some interesting results about Americans attitudes towards autonomous vehicles. Nearly one in four Americans “would never use” an autonomous vehicle. This is just one key finding from a report about the future of mobility released by Ipsos, a leading global market research firm. Ipsos surveyed more than 21,000 adults across 28 countries about acceptance of AVs, which autonomous features are most in demand, potential ownership models and regulation options. The study was conducted as part of its What the Future series, which couples survey data and interviews with experts in the field to see what “big questions” companies should be asking themselves about the future of their industries. 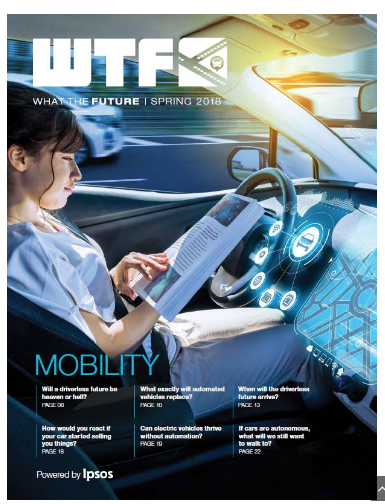 This issue of What the Future focuses on mobility, and if people are ready for the coming technology. Despite American tech and automotive companies leading the way in AV development, Americans are among the most reluctant to use it. Those in China, in contrast, are twice as likely to say they “can’t wait” to use AVs than Americans or Canadians. Perhaps the reluctance of Americans to embrace this emerging technology has to do with its strong identity as a car-culture. Nearly six in 10 people consider themselves “car people,” and 81% feel that the car they drive reflects their personality, a least to some degree. Digging deeper into the data, Ipsos found hints of a coming car-culture clash as noticeable divides about acceptance of autonomous vehicles are seen along political lines.